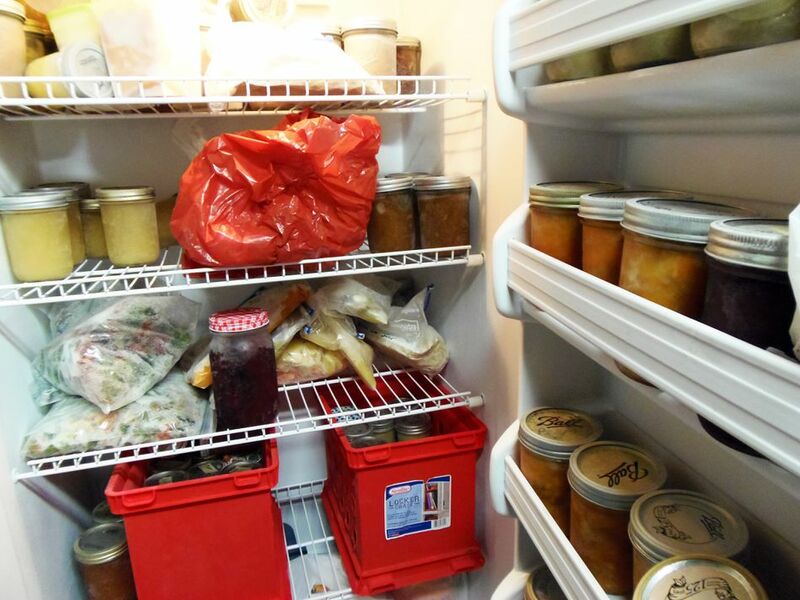 If you're going to buy food in bulk, you need to know how to store food in bulk. Because you don't want things to go bad before you use them, and you definitely don't want to create pest problems for yourself. So, let's look at the right way to store everything from fresh produce to grains and meat in bulk. Many fall fruits and vegetables -- apples, pears, onions, potatoes, winter squash -- are ideally suited to long-term storage. Just find a cool, dark place to store them, and they'll keep for months. Other fruits and vegetables need to be frozen, dried or canned if you're going to store them for the long haul. But that taste of summer in the middle of winter makes it well worth the effort. Whether you're buying half a cow from a local farmer, or snagging packages of reduce-priced meat from the grocery store, you need to wrap your purchase carefully before you stick it in the freezer. A good wrap job is your best defense against freezer burn. Freeze flour, brown rice, and other grains when you get them to kill any insect eggs that might be present (yuck!). Then, seal them in air-tight containers before you move them to your pantry or stockpile. If you have the room in your freezer, keep them there. Whole grains go rancid at room temperature in a matter of months but will keep in the freezer indefinitely. The high oil content in nuts causes them to good rancid quickly, so it's best to store them in the freezer if you have space. The refrigerator is your next best bet. And if you absolutely have to store them in the pantry, leave them in the shell, until you're ready to eat them. Milk, cheese, and eggs may not be the first thing you think of when it comes to buying in bulk, but if you can spare the freezer space, it's definitely worth stocking up when you find a good sale. Powdered milk will keep for 18 months in the pantry, so only buy what you can use in a reasonable amount of time. to extend the shelf life, and to help you determine when it's time to replace it. And milk isn't the only thing you can buy in powdered form. Keep powdered , sour cream, heavy cream and eggs in your stockpile, so you always have some on hand. Dried herbs (homemade or store-bought) will keep for years but are at their best the first year after they've been dried. So, stock up accordingly. Prefer to use fresh herbs? Then, fill your freezer when they're in season. They'll keep indefinitely. Only buy as many beans as you can use within a year. Older beans take longer to soak and cook, and they may never soften up completely. Buy What You Use. Use What You Buy. It's easy to get carried away when you're buying in bulk. Stick to the foods that you know your family will eat, and buy them in quantities that you know they'll be able to eat. A 50-pound bag of flour won't save you any money if no one in your family likes to bake, and you end up throwing 49 pounds of it away at the end of the year. Rotate through your inventory, using the oldest foods first, and inspect your food storage areas regularly for signs of pest infestations and mechanical failures. Power outages can cause large food losses when you're storing food in bulk, so it's wise to have a plan in place. How Much Does Buying in Bulk Save Each Year? Jacara Everyday is part of the Dotdash publishing family.